Eaton C Series 3-Pole Molded case circuit breaker is rated at 3-Amps and 600-Volt AC/250-Volt DC. It has dimension of 4.125-Inch x 3.5-Inch x 6-Inch. 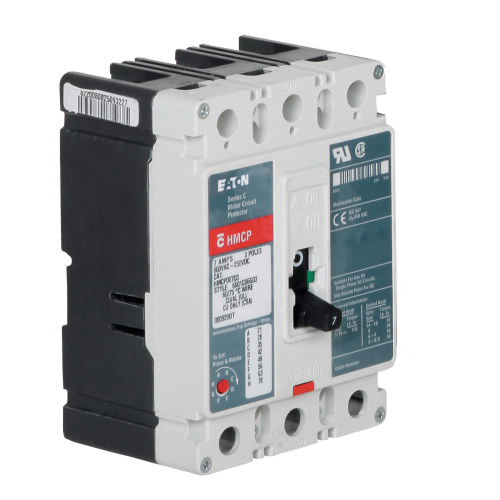 This 3-Phase F-frame circuit breaker with line and load lug terminal connection, employs magnetic trip with 9 - 30-Amp setting for ensuring reliable performance. This NEMA 0 rated circuit breaker is perfect for offering motor circuit protection to motor starters equipped with electronic overload relays. Circuit breaker is UL listed and CSA/CE certified.